We’ve recovered the old SD card from the S.A.R.T v1. 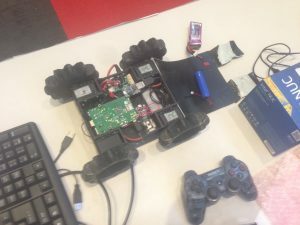 We’re going to use it to construct a streaming test on the Raspberry Pi to quantitatively analyse how much faster the streaming system on the S.A.R.T v2 is. We also need to update the IDs assigned to the servos. Currently, when the robot is instructed to go forwards, one wheel on one side goes forward and another wheel on the other side goes backwards.